It's Thankful Thursday again and our theme is courage. Laurie of Women Taking a Stand is our hostess and you can link there to visit other participating blogs. I have to confess that I'm not all that courageous. It's one thing to appear courageous. But what I way too often feel inside is ... FEAR! 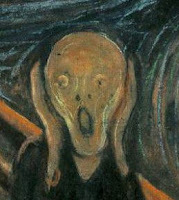 It figures that this painting was done by a Norwegian. What happened to the courageous Vikings? When I trust in myself ...I am fearful and not very courageous. But, I'm so thankful that I know where to run when my courage is gone. I was sitting next to an older woman I didn't know several weeks ago in church. When we stood to sing, she sat and cried softly. So, I sat down and put my arm around her and asked if I could help. She told me that the world had become so scary to her. She was afraid even though she was a Christian. I reminded her that we didn't need to be strong and courageous in ourselves, but we need to remind ourselves of who we belong to and ...to run to Him. I'm thankful that I don't need to know everything that will happen in the future even though my natural "self" would like a clear road map. I'm thankful that I don't have to be courageous in myself since I belong to the God who can do ALL things. I'm thankful that I am healthy and I don't take that for granted. I'm thankful that I have a sound mind and can replace the lies the world says with the Truth of God's Word. I'm thankful that I know exactly where to run to be safe; my strong tower ...The LORD. I'm thankful that I can pray and know I am heard and cared about. How about you? Where do you get your courage to endure, especially when life becomes scary? Bless you for this beautiful, heart filled post. I appreciate the reminder to "fear not". The world is a scary place. My faith is tried on a daily basis these days. I thoroughly enjoyed reading this. The graphics are perfect and so are the scriptures. I can just picture you ministering with compassion to the gal in church. Good for you. Thank you for prayers for me. My trip went well, but my husband arrived with a horrible cough when he came to pick me up in San Diego to take me home. We got a call this morning that the baby now is running a fever and cries alot. We feel terrible. Your post comforted me. Jesus is my strong high tower and I'm trusting him for healing. God bless this lady you helped. I pray she feels more peace now. Fear is a horrible enemy. Thank you for sharing Debbie. I think many of us have dealt with fear in our lives. Greater is He who is in us than he who is in the world. Excellent post! I'm so glad you were there for that sweet lady. We need to be bring others peace and security and encouragement in the Lord. Happy Thankful Thursday! 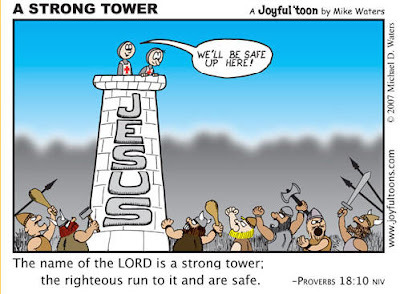 That is a great picture of courage with Jesus as the tower. I think it is so neat you could minister to the lady. Good post. I am not courageous by nature at all. I have made it a point to memorize a bunch of scriptures about not being afraid and I recite them when I get in one of those fearful places--it makes all the difference. I am so thankful for our faithful God. I notice myself getting a bit more prone to fear as I get older. The things that used to prop me up are crumbling - physical strength, physical beauty, quick mind, you name it. I watched a little old lady at the check-out stand the other day. She put her little eyes not 2 inches from the keypad trying to read it. The checker had to coach her on how to put in her PIN. Everyone was speeding around her and she moved at a snail's pace. I thought of how terrifying it must all seem to her and it broke my heart. None of us are very far from that place. What you said to that little lady was probably the best thing you could say. Christ is my only hope at 45. He'll be my only hope should I live to old age. Amen!!!!!! Love the cartoon, so true. That was such a beautiful thankful list! Have I told you lately how much I appreciate and love you? Well I do! I'm not sure which study to suggest you listen to next. I'm struggling to find time to finish putting 1 John up - I hope to do it once my book is completed next week. I loved Romans - it was a great teaching! Can't wait to meet you face to face! Your soft heart and love shines through just as it did for the woman at church. Good job - well-done faithful servant! I such a lot undoubtedly will make sure to do not omit this website and provides it a look regularly.